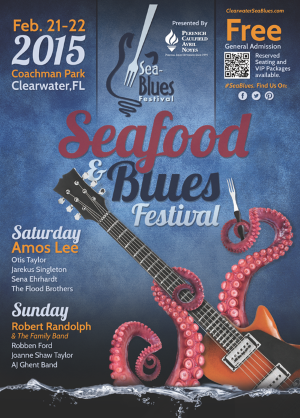 Escape winter's grip, plan to attend the 9th Annual Clearwater Sea-Blues Seafood and Blues Festival, scheduled for February 21-22 - come enjoy live music & fresh seafood with family and friends in the warm Clearwater weather. This free beach festival celebrates seafood and blues-inspired music. Amos Lee will headline the event on Saturday, with his folk-soul-jazz-rock-infused music style. Also on Saturday, blues artist Otis Taylor, with his talents to play multiple instruments, will be performing along with singer and songwriter, Jarekus Singleton, Sena Ehrhardt and The Flood Brothers. On Sunday, Robert Randolph and the Family Band will be the headliner, known for their American funk and soul sound. Sunday’s artists will also feature blues-jazz-rock guitarist Robben Ford, who has collaborated with Miles Davis among several others. Along with great blues music, festival-goers can feast on some of the region’s best seafood dishes throughout the weekend. Clearwater Beach Attractions, Vacation Rentals, Restaurants, etc. Home to some of the best beaches in America, Clearwater Beach is the perfect family beach destination. Caladesi Island, off the north end of the beach, was recognized as the nation's best by Dr. Beach. Besides the beaches, there is Clearwater Beach's hospitality and small-town atmosphere.